Jean-Georges Kastner was born March 9, 1810 in Strasbourg. He studied protestant theology at the University of Strasbourg all the while continuing to study music. His first completed comic operas would allow him to optain a scholarship from the City of Strasbourg to study music in Paris. On June 17, 1841 his opera “La Maschera“ was premièred at the Opéra-Comique. 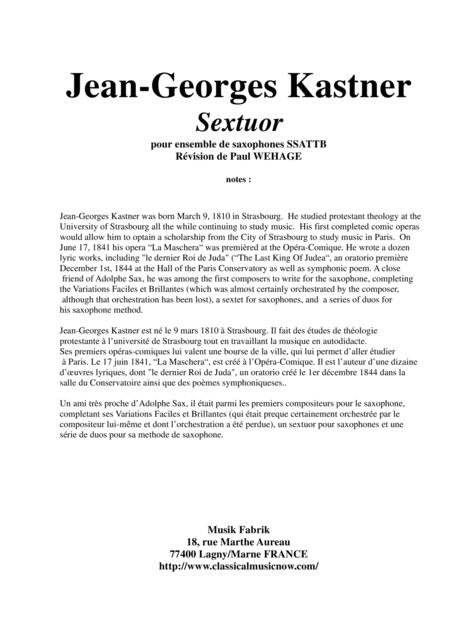 He wrote a dozen lyric works, including "le dernier Roi de Juda" (“The Last King Of Judea“, an oratorio première December 1st, 1844 at the Hall of the Paris Conservatory as well as symphonic poem. 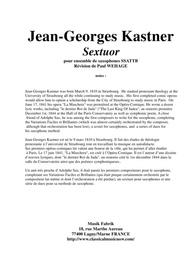 A close friend of Adolphe Sax, he was among the first composers to write for the saxophone, completing the Variations Faciles et Brillantes (which was almost certainly orchestrated by the composer, although that orchestration has been lost), a sextet for saxophones, and a series of duos for his saxophone method. This edition is in the original key of F major, correcting a transposition error commonly made in several other editions.